One of my favorite goal setting frameworks is the S.M.A.R.T. method. The S.M.A.R.T. method helps you assess the various aspects of your goal to ensure that it is a robust goal. Completing a marathon meets all of the S.M.A.R.T. criteria. In addition, it’s a nice trial goal because it’s relatively inexpensive and clear-cut, but still a stretch for most of us. 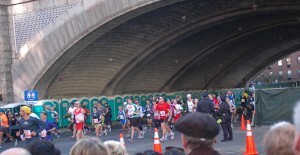 The surge in confidence you will get from finishing your marathon serves as fantastic motivation to take on more goals. Eventually, you will find yourself in a virtuous cycle of achievement! Are you ready to identify some new goals? Here’s an example of how to use the S.M.A.R.T. criteria (using completing a marathon as the hypothetical goal). Clearly define your goal, so you have the best chances of achieving it. What exactly do you want to achieve? Are there any specific components or resources that are relevant to achieving that goal? Why do you want to achieve this goal? Example: I want to run the New York City Marathon (time doesn’t matter to me, but I want to run the entire race) to raise at least $2,500 for Nick’s Fund, as a way to do something positive out of my grief about 9/11. Make sure that you can easily gauge whether progress has been made against the goal. What metrics will help you gauge progress along the way? Will it be obvious when the goal has been achieved? Example: What percentage of training runs have I completed? How far am I able to run now without stopping? Did I cross the finish line? The goal should be challenging but not unachievable. Am I capable of accomplishing this goal under the conditions I set? Do I have the resources to tackle the goal (i.e. abilities, people, budget, etc.)? Is the timing appropriate? Is it clear what actions I need to take to do this? Example: My doctor has cleared me physically to start training. I have at least 30 – 60 minutes a day a few times a week to train. Our busy season at work is before I start training. I have saved up for a few key pieces of gear that I will need for training. It’s a stretch for me as a casual exerciser, but I know that plenty of people that are less fit than I have completed marathons. I know there are plenty of plans out there that I can follow and slowly build up my endurance to run marathon distances. Select goals that support your values and long-term desires. Does this goal help you learn something or contribute in some way to your interests? Do you want to do this? Example: Improving and maintaining my health is important to me. I also want to build up my confidence to do more” big”, bold things. I already exercise for at least 30 minutes a day, but this would improve upon that and have a wow factor. I also would like to have some dedicated “alone” time each day to think. I’m a bit scared, but I want to give it a shot! Determine the time frame in which you will achieve your goal. What is the deadline for accomplishing this goal? Are there specific milestones and corresponding dates leading up to the deadline? Example: I will start training for the marathon during the first week of July. The training schedule outlines the distances I need to cover each week. By the time I complete the schedule, I will be ready to run the marathon on November 7. It’s your turn. Once you write down and accomplish one personal goal, goal setting and achieving becomes much easier. If you’ve already decided to take on the marathon, what S.M.A.R.T. goal are you going to take on next? Leave me a note in the comments and let me know! Doran, G. T. (1981). There’s a S.M.A.R.T. way to write management’s goals and objectives. Management Review, Volume 70, Issue 11(AMA FORUM), pp. 35-36.